Persons retired from the above employment as pensioners and/or annuitants under private pension plans provided for the above employee groups; members of their immediate families and organizations of such persons. In 1969 a resolution was passed by the board of directors to allow a member to remain a member and retain all credit union privileges after termination from their job. The Department of Health Education and Welfare was added to the membership field. In 1970, the credit union had 881 members and $514,369 on deposit, and was beginning to outgrow its one room office. A committee was set up to find a suitable location for a building. In 1973 with the current membership at roughly 1,000 and slightly over $1,000,000 in assets, a building was constructed at 506 W. Lamar, Sherman, Texas. The approximate cost was $38,000. During the summer of 1987, the credit union purchased an online system to handle membership records. The credit union was the only financial institution in the area with instant receipts for its members. In 1989, a Denison branch office was opened in the administration office of the Denison Independent School District. The membership had grown to 3,752 members and $15,580,000 in assets. In September 1990, the board of directors changed its field of membership to include the members' parents, grandparents and in-laws. In 1994, a building was purchased in Denison for the expansion of the Denison branch office. It had previously been in a one room office with no drive-thru window and the office was getting busy enough to grant the purchase of a building. In February 1995, Grayson County Teachers Federal Credit Union merged with Southeastern Teachers Credit Union in Durant, Oklahoma. Southeastern was a small credit union that was struggling financially and would have had to dissolve without the merger. 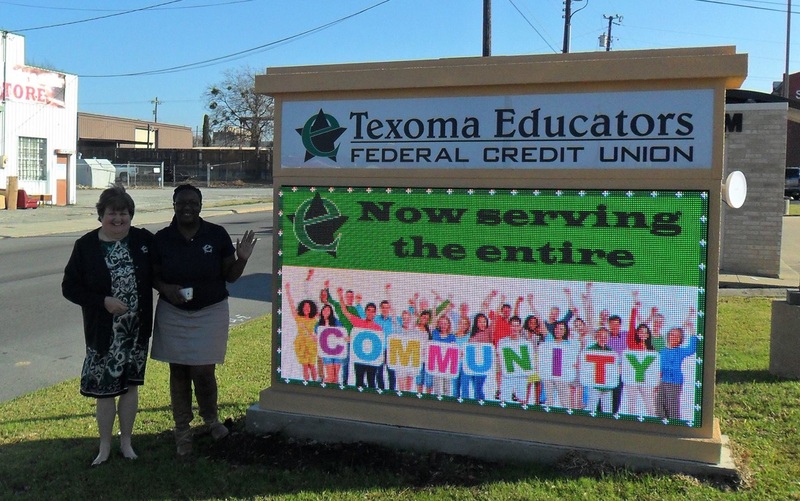 Since the credit union was no longer confined to one county, the credit union's name was changed to Texoma Educators Federal Credit Union. The only services that were offered by the old credit union were share and loans. Their new credit union offered everything a bank did, so a branch office was opened in Durant to accommodate these members. 1995 Interest refund and dividend bonuses were returned to the member in excess of $75,000.00. In 1996, the credit union purchased its first ATM machine. It was installed in the student union building of Grayson County College as a convenience to our members who work there and is expected to make money from students with foreign ATM cards. After a rough start due to technical issues, it is operating successfully. Atoka County of Oklahoma was added to the credit union's field of membership after a long battle with an Oklahoma City credit union. Atoka County had been in the field of membership of the merger partner, but was unable to sufficiently serve them due to the distance. People in that area asked to become part of TEFCU. In 1997, Automated Lending and Chek Plus checking accounts were added to the line of services. TEFCU assisted Oscar Mayer Credit Union with the plant closing and servicing of its members. Company-wide computer conversion was completed June 1, 1998 to make TEFCU Y2K compliant. $40,000,000.00 in assets was reached by June 1998. Clinton signs bill HR1151 which passes for the Credit Union Membership Act. January 2000 - TEFCU survives the 2000 millennium bug! In January 2000, TEFCU takes in Austin College Federal Credit Union and opens a branch office on site in the Administration Building of Austin College. In February 2000, the Oklahoma branch moves into their new facility at 424 N. Washington, Durant, Oklahoma. The facility includes safe deposit boxes and an on-site ATM. Internet access through EDS was implemented for member use. The members could navigate through the TEFCU website at www.texomaeducators.com and administrate their own transactions. Our first newsletter was published, called Member's Link. The newsletter is published twice a year. May 30, 2002 - TEFCU offers a new service of Visa Check Cards/Debit Cards to its members. February 2003 - TEFCU centralizes its lending services to a new technology-based program called Loan Advantage. March 31, 2003 - TEFCU completes merger with Pillsbury Federal Credit Union. July 2003 - TEFCU expands insurance coverage for members with multiple accounts. Members are now insured up to $100,000 for each account. September 2003 - TEFCU finalizes its routing number change. November 2003 - New roofs are installed on all buildings. December 2003 - TEFCU finalizes its merger with Grayson Federal Credit Union. 2004 – Online bill payment services are added to the TEFCU Home Banking system. 2004 - TEFCU holds its first logo contest for members under age 21. The winning logo was used for an auto loan promotion. February 2004 - TEFCU receives its first online loan application! April 2004 - TEFCU begins internal employee workshops to ensure better service for customers and a more knowledgeable staff. October 2004 - Denison Branch construction complete. 2005 - ATM installed on Austin College campus. 2005 - TEFCU introduces 72-month auto loans. 2005 – TEFCU begins offering Money Management Seminars to members and the community. 2006 – TEFCU introduces a new logo! 2007 – Gold Plus Checking allows members to have free checking accounts with a direct deposit. 2007 – TEFCU’s 50th Anniversary! The celebration included promotions, a feature article in Lands’ End Magazine, a new website, and an anniversary party. 2008 – Denison City Employees Credit Union merges with TEFCU. 2011 – TEFCU’s Member Referral Program is introduced. 2011 – E-Statements are added. 2011 – Student Union Accounts offer free checking, investment options, and starter credit cards for teens. 2011 – TEFCU joins social media! We are now on Facebook, Twitter, and Pinterest! 2013 – TEFCU offers updates and news by email. 2014 – Community Charter approved by NCUA. TEFCU now serves those who live, work, or worship in Grayson, Bryan, Atoka, or Marshall Counties. TEFCU will continue our commitment into the future by offering the best of breed services, while utilizing the latest technology and most importantly, maintaining the highest customer satisfaction.